Lawyers have played an important part in Indiana’s history from Territorial days to the present. 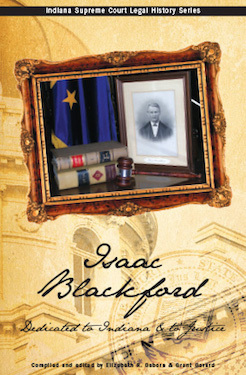 This offering from the Indiana Supreme Court’s Legal History Series spotlights the legacy of Judge Isaac Blackford. Besides sitting longer than any other justice, Blackford served Indiana as a Territorial judge and was Indiana’s first Speaker of the House. In addition, he helped to shape Indiana’s and the nation’s judiciary by publishing the opinions of the court in his Blackford’s Reports. This volume delves into Blackford’s life and judicial career by bringing together three biographical articles written over a span of 100 years. The articles reprinted here illustrate, first, Blackford’s influence on law from a nineteenth century perspective. Second, the pride his home county of Somerset, New Jersey felt towards his accomplishments in the early twentieth century. And finally, a modern interpretation of his legacy in an article prepared for a legal symposium on the history of Indiana’s courts. To further the reader’s appreciation of Judge Blackford, we have inserted primary materials throughout the publication. These materials, some dating back to 1816, include newspaper articles, hand-written correspondence, and legal documents. I am delighted to offer you this look into the life of a great man, and the opportunity to learn about Indiana’s fascinating legal history. One of the goals of the Indiana Supreme Court Legal History Series is to increase Hoosiers’ knowledge and interest in their past. Additional copies of this publication, and other materials produced by the Indiana Supreme Court’s Legal History Series, are available at no charge.